Missing teeth affect your life in a number of ways, limiting your ability to speak, eat, and smile with comfort and confidence. Thanks to modern dental technology and advanced restorative options, patients with missing teeth can once again enjoy the numerous benefits of a full set of teeth with dental implants. Drs. D’Amico and Mauck in Aurora, CO offer comprehensive restorative dentistry services, including dental implant placement, to rebuild smiles that last a lifetime. If the teeth you are missing are within the visible area known as the “smile zone,” it is likely that your primary concern is one of aesthetics. You may feel embarrassed of your teeth, hiding your smile behind your hands – or even avoiding smiling at all. This can have immensely detrimental effects on your overall sense of self-esteem, self-image, and self-confidence. Some people with multiple missing teeth will even shy away from the opportunity to engage in social functions with friends and coworkers. Missing teeth also present a very real and serious problem that isn’t cosmetic at all, but function-related. When you can’t bite or chew a variety of different foods, your body may begin to suffer from vitamin deficiencies and even malnutrition. Without the sturdy root of a tooth to support it, the bone tissue in your jaw begins to deteriorate. This can lead to an entirely new host of problems, making tooth replacement a priority regardless of where in the mouth the problem is. With dental implants, Drs. D’Amico and Mauck replace missing teeth to solve all of these problems at once, utilizing a time-tested restorative solution that allows you to eat, speak, and smile comfortably. 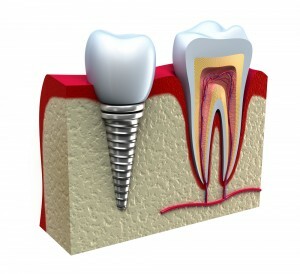 Whether you’ve been missing teeth for months or even years, or you plan to undergo an extraction soon and you’re interested in viable tooth replacement options, contact our office today and ask about dental implants. From our conveniently located dental practice in Aurora, CO, our experienced doctors happily serve patients from surrounding communities throughout the greater Denver area, including Englewood, Parker, Centennial, Boulder, and beyond. We look forward to becoming your partners in your journey toward a healthier smile!